As part of their midterm exams last week, I gave my Renaissance students several images to analyze, including one with a very earnest brown-eyed man holding–no, bearing a ring: was he mourning a deceased wife or fiance, was he himself a lost husband, or more mundanely, was he a goldsmith advertising his wares? These are the usual interpretations, and my students came up with more interesting ones. There are a surprising number of these ringbearing portraits, maybe not enough to classify as a sub-genre, but certainly more than I realized. Most art historians seem to think the portrait below depicts Bolognese goldsmith and painter Francesco Francia. 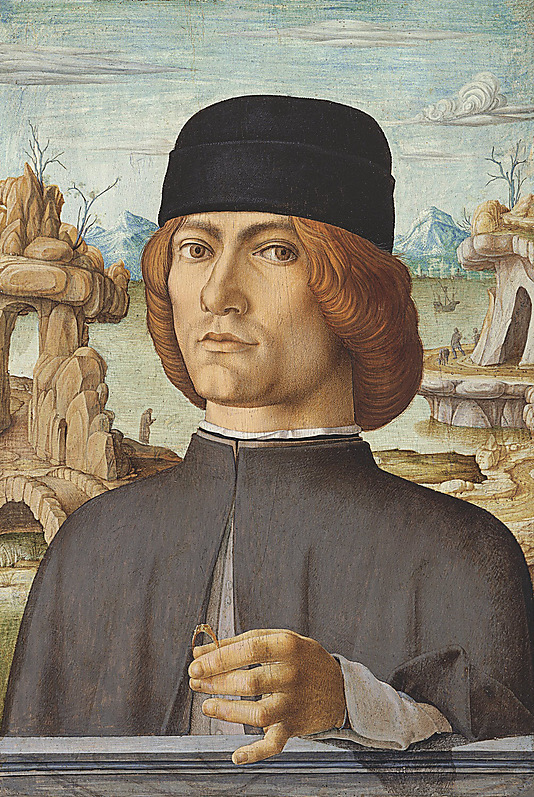 Francesco del Cossa, Portrait of a Man with a Ring, c. 1472-77, Museo Thyssen-Bornemisza, Madrid. 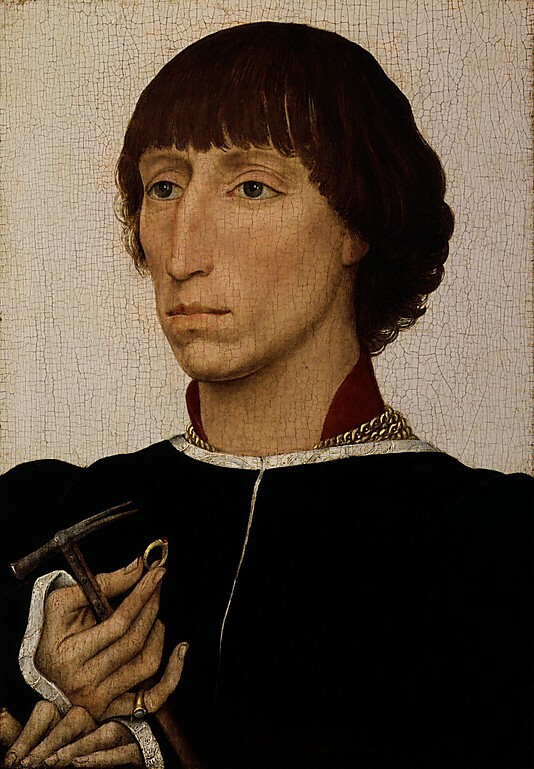 There is also a theory that this ringbearing young man was a member of the prominent Este family of Ferrara, which means he might be related to this other Francesco below, appearing in this striking portrait by Rogier van der Weyden. Franceso d’Este bears a ring and a hammer, which the curators at the Metropolitan Museum of Art believe might be jousting prizes or symbols of power. I had not thought of jousting prizes before, and while the hammer looks powerful, not sure about the ring. Rogier van der Weyden, Francesco d‘Este, c. 1460, Metropolitan Museum of Art, New York. This has got to be a northern Renaissance device/motif that found is way to Italy, like oil painting in general and portraits in particular. 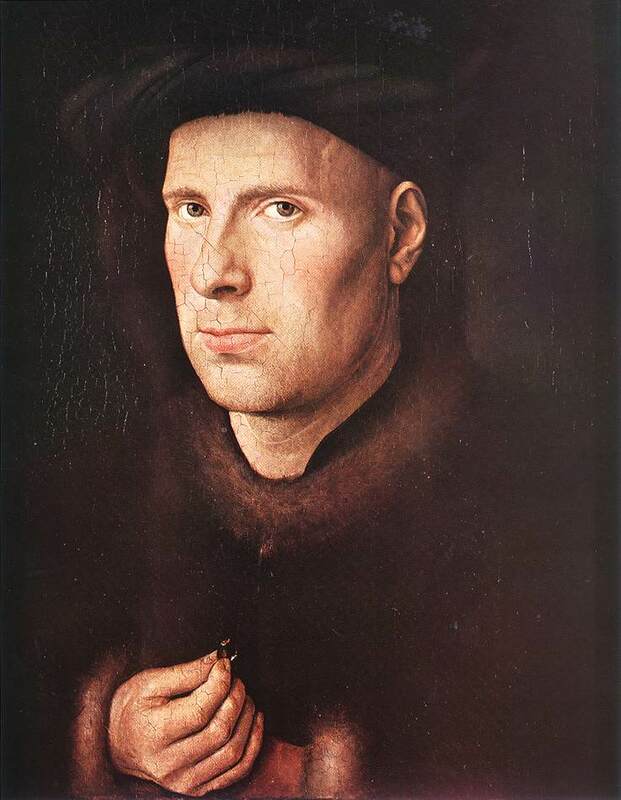 The earliest ringbearing portraits I could find were painting by Jan Van Eyck and one of his “followers”: the first painting is Van Eyck’s incredibly intimate portrait of Bruges goldsmith Jan de Leeuw, and the second is simply titled Young Man Holding a Ring. I have always found the de Leeuw portrait strikingly modern. The curators at the National Gallery of Art in London, whose collection the latter painting belongs to, explain the ring rather conventionally in terms of trade and/or impending marriage, but there is an inscription here (Lord, Let it Pass) so maybe things were a bit more complicated? Jan Van Eyck, Jan de Leeuw,c. 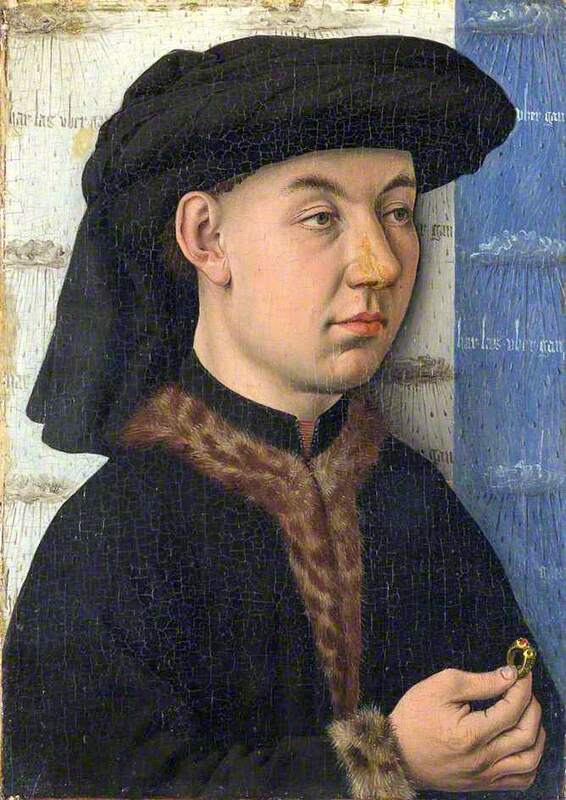 1436, Kunsthistorisches Museum, Vienna; Follower of Jan Van Eyck, Portrait of a Young Man Holding a Ring, c. 1450, National Gallery of Art, London. Don’t get me wrong–I think it’s enough that these goldsmiths are being “captured”: such a great example of the relatively egalitarian and aspirational aspects of Renaissance society and culture. I just wish I knew the whole story behind these interesting portraits. I’m the most curious about the sole woman in this group: the mysterious and beautiful subject of Lorenzo di Credi’s Portrait of a Woman (c. 1490-1500). Most likely the widowed daughter of a goldsmith, or perhaps the widow of the artist’s brother, she is clearly not showcasing her own creation but rather commemorating a relationship. 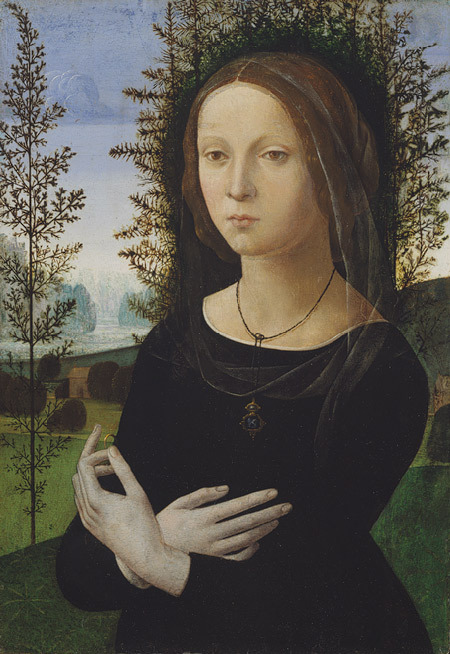 Lorenzo di Credi, Portrait of a Woman, c. 1490-1500, Metropolitan Museum of Art, New York. Two other images speak to the Renaissance fascination with jewelry and jewellers, which I think might be both literal and symbolic: one is my absolute favorite painting, Petrus Christus’ St. Eligius as a Goldsmith, variantly titled A Goldsmith in his Shop (1449) in which a couple are pictured in a goldsmith’s shop, presumably about to purchase a ring (with onlookers outside, as well as US). There’s a lot going on here: one of the acts associated with the early medieval St. Eligius was the gift of a gold ring to his contemporary Saint Godeberta before she took her religious vows. Petrus Christus might be portraying Godeberta torn between worldly and holy marriages-and she appears to be reaching towards the latter. 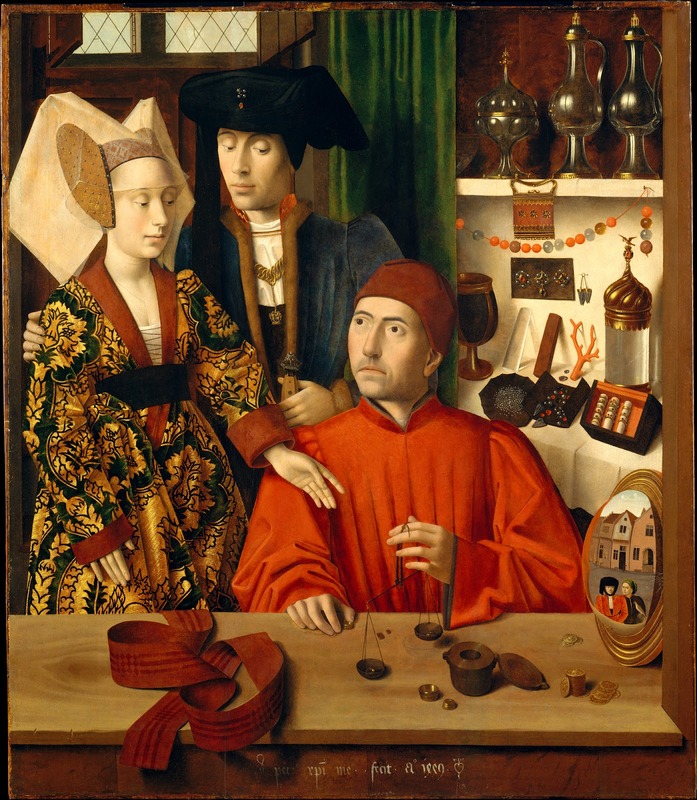 Petrus Christus, A Goldsmith in his Shop, 1449, Metropolitan Museum of Art, New York. And finally there is the symbolic signature (after 1508) of another Northern Renaissance artist. 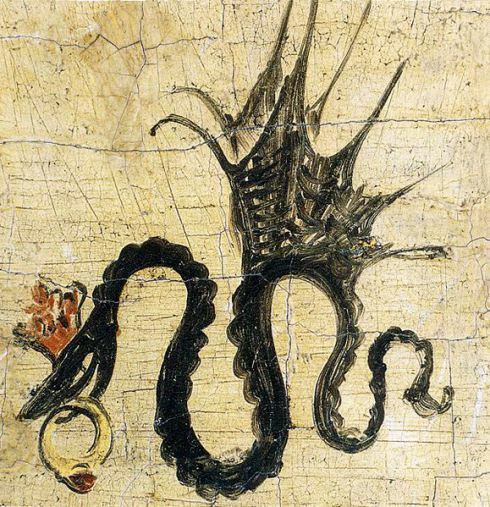 Lucas Cranach the Elder: a crowned black serpent bearing a gold ruby ring. This heraldic device, which also served as Cranach’s coat of arms, appears in many variations (which you can see here) but no one seems to know precisely what it means–perhaps the artist simply thought it looked cool. I’ve always thought that Cranach was the most interesting and enigmatic of northern Renaissance artists, working closely with Luther to advance the cause of the Reformation visually while simultaneously maintaining commissions from the Catholic Church. Throughout his life, he always seemed to be reaching for the brass ring. This entry was posted on Monday, November 4th, 2013 at 7:28 am	and tagged with Art, Decorative Arts, Renaissance, Teaching and posted in Culture, History. You can follow any responses to this entry through the RSS 2.0 feed. « Has Salem sold its Soul? I had never even taken notice of ringbearers in Renaissance art, and yes, I, too, would like to know why the motif was used with at least some regularlity. Thanks for bringing it to my attention. I find that when I look at Renaissance paintings there is often too much to see, and I notice NOTHING, and then I pick out a little detail, and then that’s all I see! Such was the case with these rings….. The complexity of some of the works is truly amazing. I suppose the artist was often doing more than simply painting an image, but telling a story, as well.